Christians today face growing challenges to show that their faith is both relevant and credible. 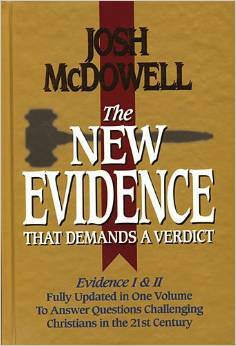 In Josh McDowell’s The New Evidence That Demands a Verdict, you’ll get the ammunition you need to defend your faith against the barrage of criticisms. This book combines the two original best-selling volumes into one, maintaining their classic defense of the faith, yet answering new questions posed by today’s culture. In this culture where truth is relative and all religions are seen as equal, Christians face a growing challenge to know their faith is relevant and credible. Maintaining its classic defense of the faith, this fully updated volume provides a wealth of historical, archaeological, and bibliographical evidences for the basic tenets of Christian belief. The New Evidence is an invaluable resource for any believer to help answer the critics of our faith. 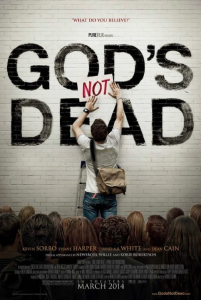 In God’s Not Dead, college freshman and devout Christian Josh Wheaton (Shane Harper) finds his faith challenged on his first day of Philosophy class by the dogmatic and argumentative Professor Radisson (Kevin Sorbo). Radisson begins class by informing students that they will need to disavow, in writing, the existence of God on that first day, or face a failing grade. As other students in the class begin scribbling the words “God Is Dead” on pieces of paper as instructed, Josh find himself at a crossroads, having to choose between his faith and his future. If Josh fails to convince his classmates of God’s existence, he will fail the course and hinder his lofty academic goals. With almost no one in his corner, Josh wonders if he can really fight for what he believes. Can he actually prove the existence of God? Wouldn’t it just be easier just to write “God Is Dead” and put the whole incident behind him? God’s Not Dead weaves together multiple stories of faith, doubt and disbelief, culminating in a dramatic call to action. What would you do if someone in a position of authority and influence in your life demanded that you renounce your faith? That’s the central question God’s Not Dead forces viewers to grapple with. And Josh Wheaton’s answer is to refuse. And then to explain exactly why he’s refusing. Would you be able to do the same?